I knew that I would be the kind of mum who likes to dress their baby up in cute and quirky outfits. Before Ethan was born, we were like most expectant parents, buying every cute outfit we came across. Little man has worn every superhero costume going already as well as Winnie The Pooh and we're waiting until he's big enough for his Kermit The Frog onesie, complete with hat. Yes, really! Well, it's our prerogative as parents to embarrass our littles ones isn't it? What we have quickly learnt, besides the fact that baby clothes with buttons are the bane of our lives and just a stupid idea, is that baby boy is prone to dribbles and can bring a little bit of milk up now and again long after a feed, so bibs are essential. Bandana bibs are everywhere and such a cute accessory for little boys in particular. Every time I see a boy wearing one, I think of a little pirate or Boy Scout - too cute for words! 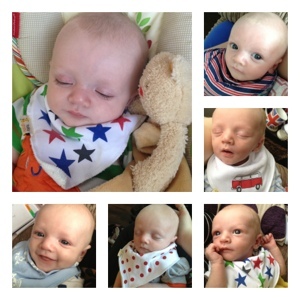 We were bought some Funky Giraffe bibs when Ethan was born by a friend (as modelled by Ethan in the pics above) and I fell in love - particularly with the skull and cross bones design and the bib with a VW camper van on (my dream car). They're a great way to add personality to a simple outfit and very practical too - Ethan nearly always wears one when we are out and about to help reduce the need for changing his clothes if he does dribble. 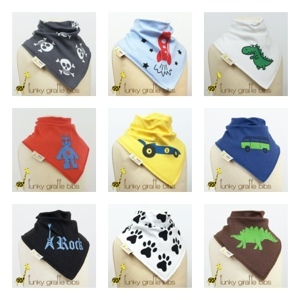 I've ordered 10 more bibs from Funky Giraffe in different designs (see below) so we have more choice, I just couldn't resist the fun prints and hope they continue to come up with new designs. They are priced at £4 each or five for £11.95 plus free delivery - great prices for something so different and of such good quality. I'll definitely be buying the Halloween and Christmas themed ones later on in the year! * Note: this is not a sponsored post, we were bought some Funky Giraffe bibs as a gift and love them so I wanted to share with my readers.